Stand Up, Stand Out is a new campaign promoting the design creativity to be found in the South West area of England (DW 21 April). To those of you reading this in Clerkenwell, that’s South West as in Bristol, Bath and so on, not as in Fulham and Putney. The campaign is a response to research that 40 per cent of British people interviewed think the South West of the UK is “sleepy”, while only 2 per cent (presumably people from Cornwall) consider it to be “innovative”. There is often a reason why research creates findings like these, and that’s because they’re true. The South West is sleepy. I mean, when you hear the bumpkin-like, soporific voice-overs to Cadbury’s Caramel ads, you don’t stop and think, “Mmm, that’s a bit old hat. The South West is actually a hot- bed of innovation”. I’m not clear whether the local designers behind the campaign think the findings are wrong, or whether they believe they are not typical of the region, and want to tell the world that they and many others in the area are full of beans. Whichever it is, the question remains: why create a regional campaign rather than promotion for their own company? Perhaps it’s because they have a genuine desire to help their local design industry peers. Perhaps they hope that by attracting attention to the region their company will enjoy some time in the spotlight. Or maybe they all got smashed on scrumpy one night and had a bet about whether they could pull off a PR stunt. Any of these is fine by me, but I particularly like the latter. Of course, there are practical reasons for wanting to draw attention to the “excellence” that goes on in an area and that is to do with two sets of people – clients and staff. A major issue for regional consultancies is that the larger local clients often prefer to look to London for design expertise (and more sophisticated wining and dining), while smaller local clients are often suspicious of the effectiveness and cost of good design. Attracting great staff is another problem. A lot of the best young talent feels the magnetic pull of the capital and leaves, while many experienced designers who look to move out of a large city and into gentler lands often want to create their own studios, not move to an existing company. So, in theory, promoting the excitement of the area helps to retain and attract excellent people, but does it work in practice? I don’t think so. About eight years ago a number of companies tried to develop a scheme called the South West Creative Awards. In its first year I went down to see the work entered and, with a few exceptions, it was pretty dire stuff. It was no surprise that the scheme didn’t work and – even though there is now probably a higher standard of thinking going on – I doubt that this new initiative will succeed either. The truth is that serious clients are not looking to appoint a region, they are looking for superb talent. It’s specifics and individuals that will help their business to grow, not a vague air of positivity. The same with staff: young and experienced designers look to join a dynamic company, not a dynamic area. The consultancy behind the scheme hopes that local companies will brand themselves with a Made in the South West of England logo (available free from netsolved.co.uk/south west). So, your company’s brand is not strong enough in its own right and you have to adopt a regional umbrella branding? Will this manage to fill potential clients with confidence? 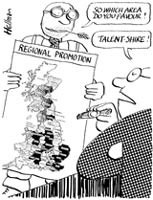 Similar regional promotion has been attempted before. In the early 1990s a number of energetic Scottish studios came to the fore. A local organisation started to promote Scottish design. I spent a week in Edinburgh, Glasgow and Dundee meeting studios and talking to them about what felt like a renaissance. It never really came. Before long the best local consultancies realised that they were better served forgetting a generic promotion and would do better if they strived to produce top work and promote themselves. Some studios thrived, others fell by the wayside – the way things should be. What’s good about Stand Up, Stand Out is that designers have got up off their arses and tried to do something about a perceived weakness. My advice to them, however, is to forget collective promotion and focus on making their individual companies as exciting and well-known as they can. It’s good to contribute to your local community, but this is a case where charity should begin and end at home.